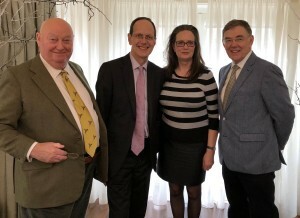 Businesses within a 50-mile radius of Rutland represent the engine for growth to drive a successful post-Brexit economy, claims former CBI chief John Cridland. Mr Cridland outlined his vision for a new growth model as guest speaker at the Biz Club lunch, held at the Falcon Hotel in Uppingham, (Friday 23 March) in his current role as the independent chairman of Transport for the North. A large number of guests heard that Northerners earn £5,000 less than Southerners with the impact also felt in the Midlands. Mr Cridland said the solution to getting the Northern and Midlands’ economies on the right track, includes increased investment in education, improved transport links and infrastructure. He identified growth businesses as a key area for expansion, with medium sized businesses in counties such as Rutland ideally placed to grab a greater share of the global market.